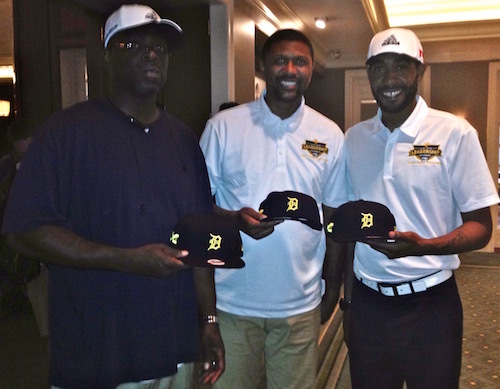 Above is an iFolloSports.com original photo of Jalen Rose, Ray Jackson and Jimmy King at the recently played 5th Annual JRLA Celebrity Golf Outing. The event was held at the Detroit Golf Club, with coverage provided by iFolloSports.com Michigan correspondent Lance Martinez. The gala took place in conjunction with the Jalen Rose Leadership Academy, an organization dedicated to improving student dropout rates. In addition to 60 percent of the Fab 5 being present, many other Michigan sports luminaries were on hand, including Mateen Cleaves and Chauncey Billups. Rose has been a fixture on iFolloSports.com this summer, including another major charitable appearance in his hometown of Detroit and a sighting at an LA restaurant.